Hippopotami ranches in Louisiana have failed and the surviving hippos turn feral and man-eating. On the Mississippi, a dam keeps the creatures from travelling overland. The government wants to rid itself of the animals and open the river. Winslow Houndstooth and associates are hired to do the job. 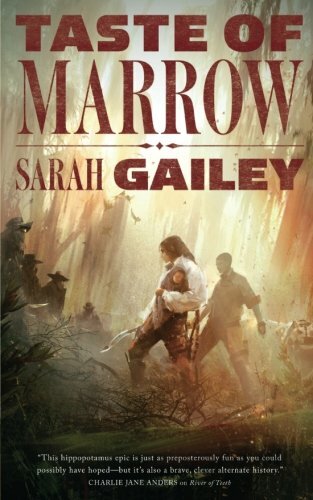 Part Two of Sarah Galley’s alternate history picks up several months after the ending of Part One. Following the destruction of the Harriet dam, many songs were composed about the disaster. All ended with everyone dying. The fact is: Everyone didn’t die. Many escaped, Houndstooth and his people among them. Surprising associations had tentatively begun between Houndstooth and the sexually ambiguous Hero Shaklesby, and U.S. Marshal Gran Carter and con woman Regina “Archie” Archimbault, but the lovers are torn apart by the Harriet’s demise. Feral hippos are now loosed upon the Mississippi, bringing death to anyone unfortunate enough to be on the river. Slowly working their way inland, they leave blood-laced water and corpses in their wake. Into this dangerously unsteady state of affairs, assassin mother-to-be Adelia Reyes gives birth to Ysabel, the child sired by her sometimes lover, gambler Cal Hotchkiss, killed early in their mission. With her is Hero, pining for Houndstooth. With Ysabel’s birth, Adelia officially retires from murder-for-hire. Then Ysabel is kidnapped by their original employer, Whalen Parrish, who has a newer, more insidious scheme. Currently owner of 90% of the boats on the Mississippi, the Ponchartrain, and the Ohio River, he now wants to run the Bureau of Land Management. It’s more than that. Parrish wants to wipe out all hippos, both feral and tame, so “this long embarrassing chapter in our nation’s history will be over.” The ransom demand is an order for Adelia to kill Parrish’s boss . . . or never see her child again. What neither Adelia, Hero, nor Parrish know is that Archie, Houndstooth, and Marshal Carter are also on their way, if not to the rescue, at least to a confrontation. They say journeys end in lovers’ meetings, but often, it can also end with old enemies, one-night stands, and feral hippos converging on the same spot. This time no one may survive. The adventurers may not be the most worthy souls to emulate, but their courage and steadfastness commitment to each other can’t be argued. In this continuation of the tale begun in River of Teeth, the story isn’t so much about revenge or settling old debts as it is of the transformations brought about by love. Though no less bloody and brutal than River of Teeth, this is a character study of the changes love in its various forms makes in individuals accustomed to lives of violence. It also details the sacrifices each will make for that love: Houndstooth in his attraction to Hero, Adelia for her daughter, Carter for Archie. Everything, even the ravaging feral animals, takes backseat to the “gentler emotions” each experiences in his or her own way. Gentle in theory, at least. As with the previous novella, this one also ends on a cliffhanger of sorts, a conclusion some might not have considered inevitable or even expected, but nonetheless very satisfactory. For those having never met this band before, there’s enough exposition that the story can be picked up in mid-stride, as it were. With a ridiculous but historically true premise, it’s a fantastically good read.